My research shows the condition is also known as Sensory Integration Dysfunction (SID). Thank you for hosting this giveaway! This is a great and informative piece on SPD. The comment above, is true: it used to be SID, but with the push to get it recognized as a true "disorder" (not a dysfunction) in the DSM, they have moved to using "SPD". My experiences with sensory disorders are few, but growing. One of the children in my class that Im student teaching with has a sensory disorder. The main thing Ive noticed about her is that she likes to touch my hands and hold my hands. My son has Sensory Processing Disorder. We have used a weighted vest for years. It really helps him to stay centered. 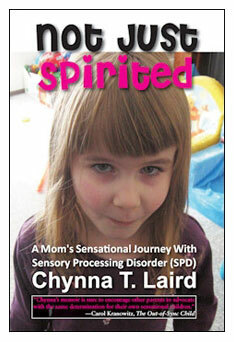 One of the problems with SPD is people usually judge your child as being badly behaved or a result of bad parenting. I think if more people were aware, the could recognize that people with SPD actually are functioning amazingly well despite a world that is filled with sensory over-load! Thanks for the giveaway! I'm really excited to find out about this book! Something interesting happened to my three year old son today. He has responded well to Play Doh and silly putty and I thought he would get a kick out of homemade goo (cornstarch and water). For the first time ever, my sensory seeking child GAGGED from seeing and feeling the goo. To me, this response seems inconsistent. And then I learn today that inconsistency is the hallmark of a neurological disorder.